Like any number of the kiddos we serve, Emmett has challenges with vestibular underresponsiveness. And because his vestibular system isn’t reliably producing the kind of input most folks receive – relaying, for example, to what degree his body is tilted forward or backwards as he’s walking, and how quickly he’s moving through space – Emmett has learned to compensate with his visual and proprioceptive skills. That’s worked to a point but it also means that sometimes, instead of walking through a room unimpeded, Emmett ends up crashing into things. The task now is to sift through all those compensations, remind the various parts of Emmett’s sensory system of their proper roles, and get everything working in concert. All of that is exactly what Miss Lean and Emmett are working on in occupational therapy. 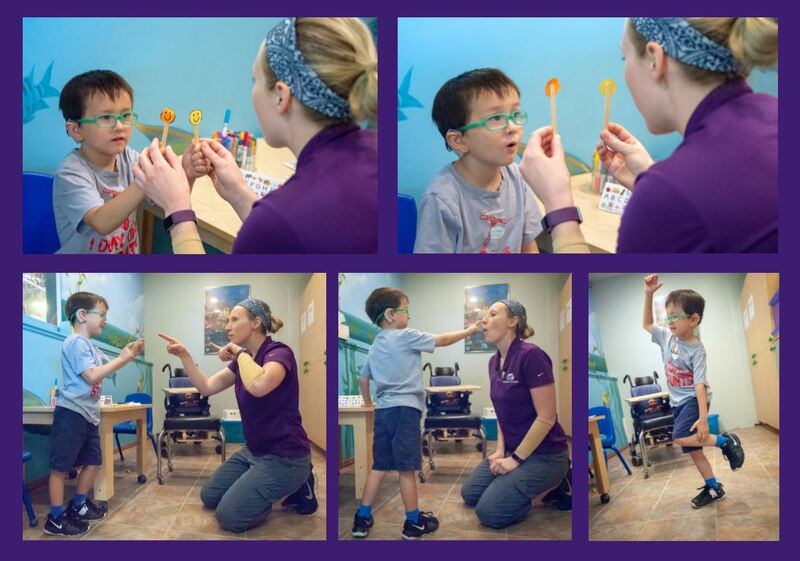 In this series of photos of the clinic-based portion of Emmett’s treatment, he and Leah are working on functional visual, body awareness, and balance skills. What does that mean for Emmett? Hello increased safety and independence! Instead of crashing into things, Emmett will have the skills to navigate his environment, focus in class, and play on the playground. It’s big work but Emmett and Leah are up to the task. Keep it up you two!